Closed - gone bust. They couldn't compete with the more traditional pubs on Dale Street like Rigbys, the Vernon Arms or Ship & Mitre. Closed down by the looks of things! The Bierkeller has been open for about 1 year (?) and when I first started to go here each table had a menu listing the dozens of foreign bottled lagers and beers. The menus no longer exist and, looking in the fridges, the range of bottles isn't as varied as it used to be. They eventually introduced two handpumps for real ale and always had a LocAle (e.g. Cains, Liverpool One Brewery, Spitting Feathers etc) available. About a month ago the two hand pumps were removed and haven't been replaced. 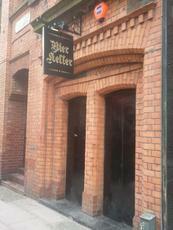 In the past the Bierkeller was always closed on Sunday, but recently I've noticed it's now also closed on Monday's. Sometimes I've been the only customer and on one occasion, after I'd finished my drink, the manager said he was closing for the day. It was only 6pm! The Bierkeller is a great concept but sadly a lack of customers doesn't make its future look too good. Relatively new venture on Liverpool's burgeoning Dale Street real ale scene. I went in shortly before Christmas, so the information given amy have changed slightly. As the name suggests, it's a basement bar in the German tradition, and on my visit an empty cavern with whitewashed walls and spartan furniture was found. Given that this was very early on in the pub's life, this has hopefully changed for the better, although it did feel like a vast place. A solitary handpump wasn't serving on my visit, although real ales were promised and I imagien this too has changed. What won't have changed will be the vast array of bottled beers avaiable from all corners of the globe, reflecting the modern trend for'craft beer' (a term that leaves me cold). I had soemthing from Namibia which i rather enjoyed. All in all, a worthy venture which I hope succeeds, I can imagine it will make a fien addition to the Dale Street crawl.